Jules is a young man, barely a century old. He's lived long enough to see the cure for death and the end of scarcity, to learn ten languages and compose three symphonies…and to realize his boyhood dream of taking up residence in Disney World. Disney World! The greatest achievement of the long-ago twentieth century. Now in the keeping of a network of "ad-hocs" who keep the classic attractions running as they always have, enhanced with only the smallest high-tech touches. Now, though, the "ad-hocs" are under attack. A new group has taken over the Hall of the Presidents, and is replacing its venerable audioanimatronics with new, immersive direct-to-brain interfaces that give guests the illusion of being Washington, Lincoln, and all the others. For Jules, this is an attack on the artistic purity of Disney World itself. We will send Down and Out in the Magic Kingdom to your Kindle at . 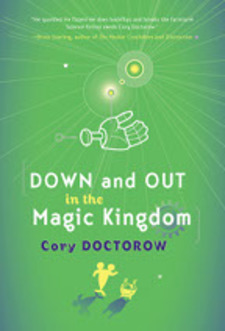 Down and Out in the Magic Kingdom has been sent successfully to your Kindle!